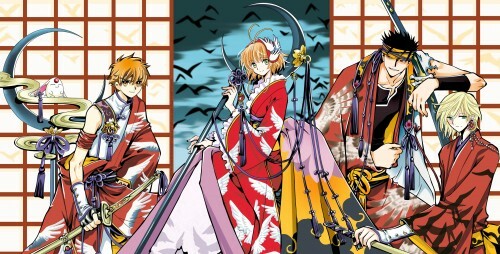 Tsubasa Reservoir Chronicle: . :The beautiful wonders of vector art:. 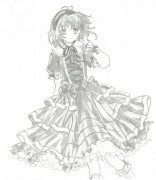 Minitokyo »	Tsubasa Reservoir Chronicle Indy Art » Tsubasa Reservoir Chronicle: . :The beautiful wonders of vector art:. you must be insane but very very great work. 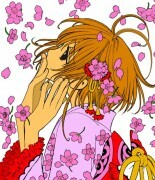 love everything about it.. so nice..
Oh wow, I can't believe you vectored all this! It looks great! All the details and coloring are very well done. I can image what a pain this was! The hard work paid off though. Wonderful job! woww looks like a pretty complicated vector! I see some coloring parts sticking out from behind the outlines, and the blurred wings on kurogane's robe looks a bit odd because pretty much everything else has clear outlines. I like how sakura and fye's hair has thin lines, i like that style, but then syaoran has thick lines in his hair so that kind of throws you off. I think if youre going to make some things look painty, then you need to add more of that rather than doing it in just parts of the scan. whoaaa... you're insane to vector the whole thing! the painting is outstanding. I like it a lot. the only problem of this vector is the lines. some lines are not ok and give a strange feeling while seeing the image. if you could improve that, this vector would be perfect. Such beautiful details! It's a perfect reproduction! wow. this is completely amazingly. i cant believe you vectored it. Wonderful! The vec program might be a lil' odd, but the result simply makes you forget about it, right? It's a great piece of work! Many details carefully traced, simply great!